Many vacationers find themselves short on time, and with too many wonderful activities to do in Glacier Country Region in Northwest Montana. Swan Mountain Llama Trekking is pleased to offer guests an overnight llama trek that can fit into anyone’s tight vacation schedule. These overnight guided camping trips are strictly on a guide/llama available basis, and can be scheduled for any departure/return dates between late June and mid September. Guests need to arrive at Swan Mountain Ranch at 8:30 am on day one for their overnight guided llama trekking adventure. Once everyone has arrived, we will give a llama orientation and trail safety speech. Then everyone will be piled into our llama trekkers van, and we will drive with trailered llamas in tow to the trail head for Bond Creek in the Flathead National Forest. Upon arrival, we will unload guests and llamas alike, pack up our lunch provisions, our overnight gear, and head out onto the trail. Guests will be treated with killer views of the Swan Valley and the expanse of the Swan and Mission ranges, and can look across into the famed Bob Marshall Wilderness Complex. We will trek a comfortable 3-5 miles distance, until we reach one of our many “secret” camping spots to hold up for the evening. Your professional llama guides will set up camp while you enjoy the scenery, fish or perhaps take a peaceful mountain top nap. The guide will prepare a sumptuous dinner, and if permitted by the Forest Service, will build a camp fire for guests to enjoy while the cleanup of the kitchen is wrapped up. Many guests like to take an after dinner stroll or fish, read a book by the feigning mountain light or sit around the fire sipping hot chocolate or your favorite trail libation. In the morning we’ll have a hearty breakfast, and take an early morning hike to explore the area. Guests can stay and fish, climb a mountain peak, or whatever they feel like; after all it’s your vacation! Right after a picnic smorgasbord lunch, the guide will pack up the llamas, and lead the trek back down to the trail head. Once done with our hike, we’ll head back to Swan Mountain Ranch, and have you on your way by 5:00pm. 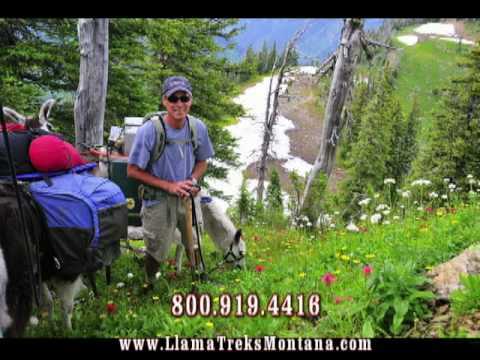 Swan Mountain Llama Trekking has the ability to go to other locations for your overnight llama adventure, and reserves the right to change locations if necessary based on trail conditions, fire concerns or party size. If there is something you would particularly like to do on an overnight llama trek, please ask, as we have the ability to customize all of our llama treks to suit the needs of our guests. 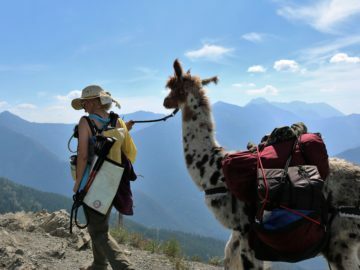 Swan Mountain Llama Trekking’s guided camping trips offer the ultimate summer outing through some of the most spectacular scenery in Glacier Country!